Follows the changes that occurred in post-2008 corporate America when companies reduced people, not infrastructure in the scramble for more money. Where do the high-flyers go when their jobs are no more? 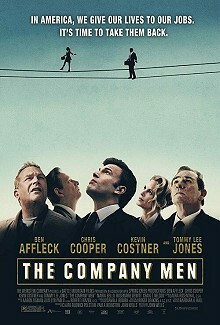 Ben Affleck and a team of veteran actors play corporate high-flyers who have been living the very high life only to discover that their jobs are gone, and that they must find a way to come back again. This film fits nicely with Inside Job, looking at the problems caused by corporate and financial sector greed, this time from the point of view of those whose big salaries have led them to lead big, expensive lives. Suddenly they find themselves in a world that questions their worth. The Company Men raises the question of just how much hope there is in the workforce today. It doesn't spend too much time looking at causes, but considers the fates of a group of people that it is difficult to feel a great deal of compassion for. It a story of the times in a era where we would much rather escape from realities than watch them. Ultimately the film isn't as strong as the tagline: In America, we give our lives to our jobs. it's time to take them back .